I’m not generally one for tooting my own horn, but here at the end of 2009 it looks like I was a good two years ahead of the curve when I predicted the cassette revival waayyyy back in February of 20022007. I must admit that my prediction was a bit tongue-in-cheek, not so much because I didn’t think it was possible or reasonable, but because my cynical side can’t help but be a little…er, cynical, about resurgences of technology recently considered passé or obsolete. Earlier this year I noted the appearance of more cassette-based indie rock labels, mostly dealing in very limited-edition runs of EPs and albums. My own recent travels to record stores like Aquarius in San Francisco and Reckless in Chicago turned up small cassette sections in both store where just a couple of years ago there had been none. But the real cherry on top was stumbling across recent posts all about cassettes at Stereophile magazine, the home of super high-end audiophiles, where CD players can cost $17,000 and speakers require a second mortgage. Stereophile’s Stephen Mejias was himself spurred to think on the subject of tapes by a recent article by Calum Marsh in PopMatters, “Reconsidering the Revival of Cassette Tape Culture.” Critical as Marsh may be about this ferric oxide return, his very tackling of the subject admits one simple fact: a cassette revival indeed has occurred. And who was there first? Uh huh, that would be the mediageek. Aside from the fact of my first arrival, however, I’m rather ambivalent on the whole debate on whether or not the cassette revival is just crass indie-marketing sheathed in manufactured street-cred. For those with still serviceable cassette decks I guess it’s kind of nice to be able to get some new tunes that you didn’t have record yourself. 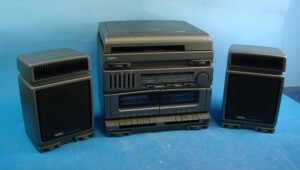 At the same time, the reason I have working cassette decks is because I still have music on cassette not duplicated in another medium, and I still find albums on cassette that are expensive or nearly impossible to find in another medium. I guess these special cassette-only releases qualify, in a way, though by design, not happenstance. 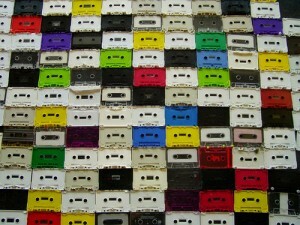 It’s not like cassette-only labels are anything new. Labels like ROIR were cassette-only back in the 1980s, and many cassette-only labels have survived in the interim due to economics and ease of one-off duplication and distribution, if for no other reason. The only reason we can call it a trend now is that bands that otherwise have seen relative indie success distributing their music on CDs are turning to cassette labels for limited editions. If it was still mostly the domain of bedroom noise and industrial bands, we probably wouldn’t be reading about this trend in as mainstream a pub as Stereophile. Now that indie rock collectors and other hip elites can snarf up limited tunes on cassette I’m wondering if we’ll start seeing more plastic fantastic decks show up in Target, and if the used market will inflate. If you’d taken my advice two years ago then you’d probably be sitting pretty on a nice deck that sold for hundreds in the 80s but that would’ve cost you $15. You’ll be spending more on a super-exclusive new tape by a bunch of bearded guys from Portland. Now I’ll sit back and see if this hot new trend makes it all the way through 2010 and outlives being a trend, like the vinyl resurgence has. Meanwhile, I’ll remind you that my hipster trend-spotting consultancy is still in business, but my rates are going up fast. You called it dude! What’s next?